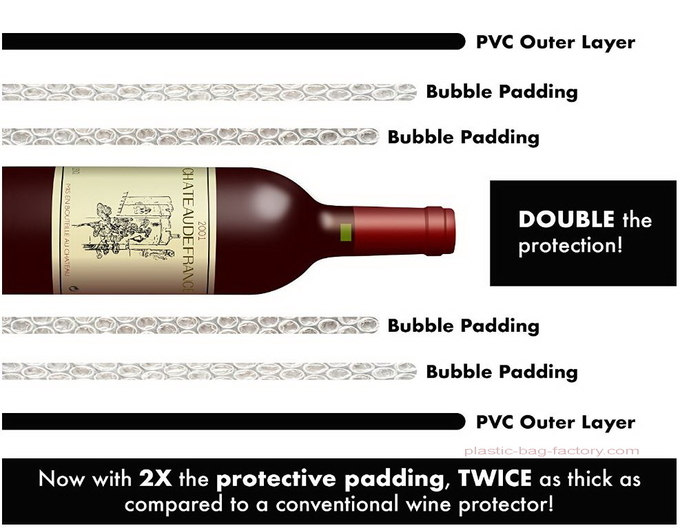 Wine Bubble Bag is a wine-bottle-shaped bubble wrap that fits into another wine-bottle-shaped plastic covering. It is made of two parts, outer is a durable, puncture-resistant plastics bag, the inner layer is bubble film, which can be widely used in traveling and protect wine bottles safely and securely. It takes advantage of the bubble film shock-proof and outer Plastic bag soft features. There is a couple of peel and stick seals at the bottom opening to keep it closed. They keep your wine bottles without any breakage or leakage. Wine bubble bag is the first and only way to safely and securely transport wine bottles without leaking or breaking inside your luggage or during shipment. It is the leak-proof transport system that is affordable, easy to use and secure. Just place the bottle into wine skin bubble bag and its double seals help keep your precious cargo impact during transport or shipment. If you hit turbulence, the seal prevents any liquid from leaking out and ruining your clothes.